I talked to some of yall about the sunset and how many hours of light during winter and summer we have up here in the north world. 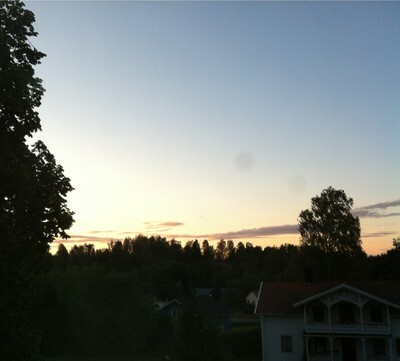 This is is picture at 11pm and it will almost be this light the entire night long, we get 20 minutes more dark everyday, so in august we will have regular day/night hours again, but just for a few weeks until it starts to get darker for the winter. The sun hours are worse the more north you get Sweden. Todays weather temperature was 60 degrees Fahrenheit, I wish we could have some of your heat! I stayed in Jennifer Marlins house with her family the two first weeks until they went on vacation to Florida. And the last week I stayed with Beverly Cain and her family, they were very kind to me. I have meet many great people that I have missed very much. It was not as bad as I thought it would be to be back, even if this is very hard. The weather was not as bad as it use to be, not much humidity and acceptable heat. Try to tan away paleness but that seems to be impossible. We went to Memphis downtown and went on the trolley, walked on Beale street and took a picture with duck at the peabody hotel. It was a great day with Jennifer, Malory and Lindsey. I went to the zoo with Shirley and Alica, had a cook out with the youth group, had lots of sonic, went to yard sales, went to the movies, had catfish in Byhalia with tha Cains, had dinner with the people who were first the wreck scen, met the layer, hanged out with Brice, and met many more great people. It has been a great visit to the states and I am looking forward to the next time.